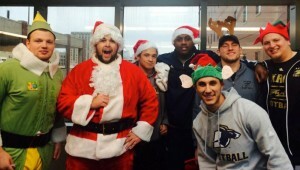 The University of Akron football players visit Akron Children’s Hospital before every home game in the fall, which is 6 times throughout the season. During Christmas, one of the players always dresses up as Santa. This year there was even an Elf.